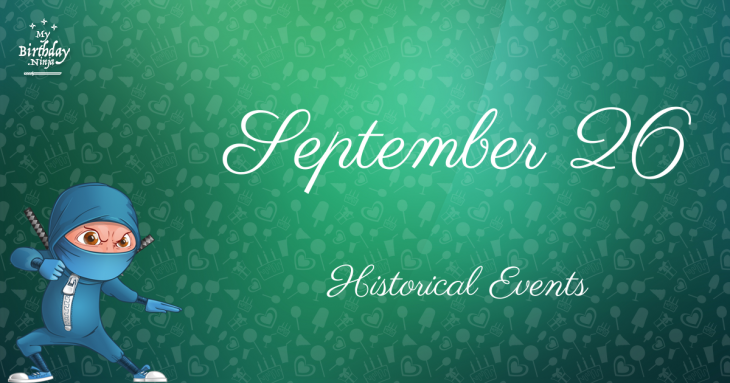 The following events took place on September 26. The list is arranged in chronological order. Found 51 events. Showing 1 - 30. American Revolution: British troops occupy Philadelphia. Thomas Jefferson is appointed the first United States Secretary of State, John Jay is appointed the first Chief Justice of the United States, Samuel Osgood is appointed the first United States Postmaster General, and Edmund Randolph is appointed the first United States Attorney General. The Holocaust: August Frank, a higher official of the SS concentration camp administration department, issues a memorandum containing a great deal of operational detail in how Jews should be “evacuated”. Japanese rail ferry Tōya Maru sinks during a typhoon in the Tsugaru Strait, Japan killing 1,172.